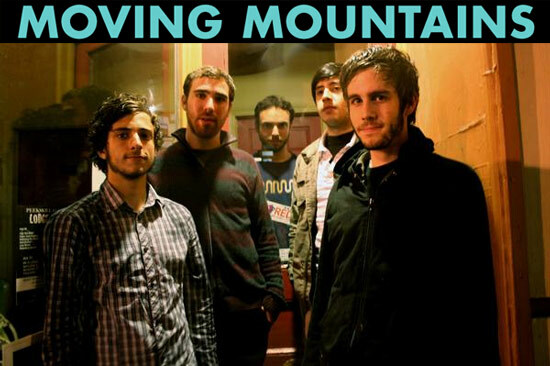 New York post-rock band Moving Mountains are doing some incredible things for their age. Still in college, the band is balancing school-work along with touring, recording and even producing their own music. With both their full-length album, Pneuma, and their EP, Foreword, being self-produced the band has gone through a lot of trials and practicing to bring you what you hear on their albums. Scene Point Blank spoke with vocalist/guitarist Gregory Dunn to give you an inside look at their production and what they have in store for the future. Scene Point Blank: Alright, so I guess we should start with some introductions. What is your name and what is your role in Moving Mountains? Gregory Dunn: My name is Gregory Dunn and I play guitar and sing in the band. Scene Point Blank: So you and the rest of Moving Mountains produced Foreword yourselves? Gregory Dunn: We all wrote the record together, but it was primarily produced by myself. I spent the majority of my sophomore year of college not doing schoolwork but engineering and producing that record. Scene Point Blank: Ahh, nice. Gregory Dunn: Many long nights. Scene Point Blank: Haha, I bet. That's very impressive. Scene Point Blank: I actually saw a few videos on Youtube of you guys recording the EP. Looks like you guys have a real good time in the studio. Gregory Dunn: Haha, sort of. We recorded Foreword three times in tons of different places, including apartments and bedrooms. The majority of what stayed on the record was recorded at The Geller Cellar in Mahopac, where I am now currently recording another band's record. But yeah, I remember I recorded most of the vocals in my brother's apartment in Brooklyn while house sitting. Scene Point Blank: Is this other band a side project or are you only producing their album for them? Gregory Dunn: With time off from playing shows, I do a lot of side engineering and production work. I wish it were a side project but I haven't had time to focus on anything like that. Scene Point Blank: I can tell that a lot of the production and engineering work you do pays off. It really shows on Foreword and Pneuma. Gregory Dunn: Thank you! Pneuma was actually a ton of trial of error. That was done in my basement during high school...Nick and I had no idea what we were doing initially but we were very pleased with the feedback we received with the months following it being released on the Internet. Scene Point Blank: You were only in high school when you recorded Pneuma? Scene Point Blank: I hear ya.. I just finished my senior year. I can safely say that Pneuma is better than anything that any band from my high school has put out. I did notice that Foreword's sound is a lot more...."bigger" than Pneuma's. What did you do differently when recording the EP? Gregory Dunn: Well for one, I had the other guys around to help write the record. But that was one big thing we wanted differently on Foreword, the overall dynamics of the CD. We wanted the bigger parts to be bigger, and the softer ones to be softer. I think in "Armslength" we tracked seven or eight guitar parts in the heavy part around five minutes in. Words by Corey S. on Oct. 16, 2010, 11:05 a.m.
Posted by Corey S. on Oct. 16, 2010, 11:05 a.m.
Posted Oct. 18, 2015, 3 p.m.
On Nov. 27 Triple Crown Records will release a new 4-song split EP bteween Moving Mountains and Prawn. The EP contains all new material from the two bands. Posted Aug. 13, 2013, 10:49 a.m.
Posted Oct. 13, 2012, 1:35 a.m.